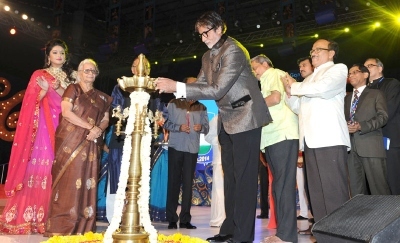 “World is a village, let us be good neighbours”, said Big B – Amitabh Bachchan, after inaugurating the 45th edition of International Film Festival of India in Goa today evening, echoing the Indian spirit of Vasudhaiv Kutumbakam. His message at the end of 25-minute long studious speech was significant as the IFFI 2014 is being held with China as the country focus while showcasing outstanding films from eight SAARC nations of South Asian region. The veteran film star of India also appealed to take the spirit of inclusiveness from multicultural and plural Goa in accomplishing this task of being a good neighbour. “If world is a village, remember that we are its custodians. Don’t take this responsibility lightly. That baton has been passed from generations together and it is our responsibility to behave in a responsible manner”, said Bachchan. He said the spirit should be like we witness while watching a cinema, where everybody enjoys it together without asking which caste, religion or creed we belong to. While admitting that Indian cinema was ridiculed at international level, the Big B said it has been now finding a way to compete at international level. He took the audience through a century-long journey of Indian cinema which, he said, has depicted the socio-cultural face of India while providing voice to the voiceless. He named several filmmakers from Satyajit Ray to V Shantaram, Himanshu Roy, Raj Kapoor, Bimal Roy and even recent films made by Mani Ratnam, Aamir Khan and Vishal Bhardwaj, but primarily the Hindi cinema. Bachchan however acknowledged the contribution made by regional cinema in different regional languages, especially Bengali, Malayalam, Tamil, Kannada, Marathi and even Konkani. Goa may a small state, he said, but India needs to learn from it the sense of unity in diversity. 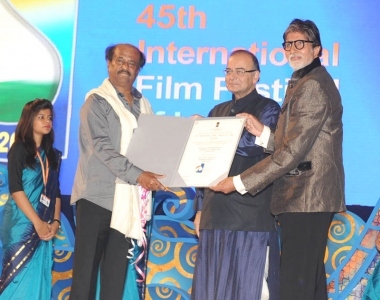 Rajanikanth, the mega star of Indian cinema in the South as well as the North, was conferred with the Centenary Film Award at the hands of Bachchan and information and broadcasting minister Arun Jaitley. With tears in his eyes, a simple-clad Rajanikanth dedicated the award to all his producers, directors, technicians and the whole audience. Jaitley said Indian cinema has offered young growing minds the vision to learn and nurture talent rather than through formal school education. “Cinema has acted as the alternate religion as it entertains, educates and gives a social perspective to several issues confronting the society”, he said. Union defence minister Manohar Parrikar, representing Goa, said IFFI from next year would be held at a permanent venue of its own. Chief minister Laxmikant Parsekar also echoed similar sentiments. Goa governor Mridula Sinha, Minister of state for information and broadcasting Rajwardhan Rathore and India’s veteran filmmaker Gulzar was also present on the dais. Anupam Kher and Ravina Tandon compered the colourful function held at Shama Prasad Mukherjee stadium in the Goa University campus.